Allen Air > Refrigeration Maintenance Done Right! Our seaside client “Murphy’s Irish Pub” has equipment that is susceptible to corrosion. 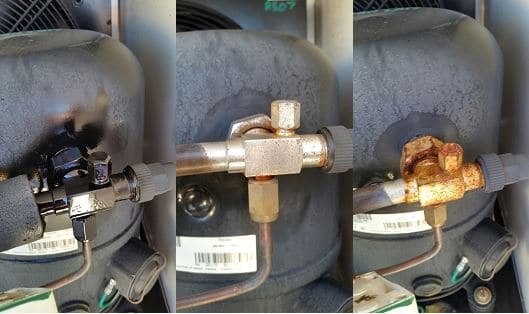 So, when our experienced tradesman, Trent Hiller, noted rust forming on the suction service valve of the condensing unit, he was quick to run the wire wheel over it and repaint it. Trent’s experience taken from years of service means that he has seen many service valves that rust out and result in gas leaks. A little effort now will have saved our client hundreds or thousands of dollars in the future. At Allen Air and Refrigeration we are proud of the quality work that our tradesmen perform. Well done Trent!